Canada is a stronger country thanks to the millions of refugees who’ve made their homes here, said former Governor General Adrienne Clarkson. But, she added, we must do more to help them integrate with dignity. Ms. Clarkson delivered her remarks in a keynote address at the Re-imagining Refuge Symposium hosted by York University and Universities Canada in Toronto on October 17. As Canada’s 26th Governor General, Ms. Clarkson’s story is well-documented. She came to Canada as a refugee in 1942 with her family and became one of Canada’s most prominent personalities and public servants – a CBC broadcaster, author, and the first person of colour to hold the vice-regal position. 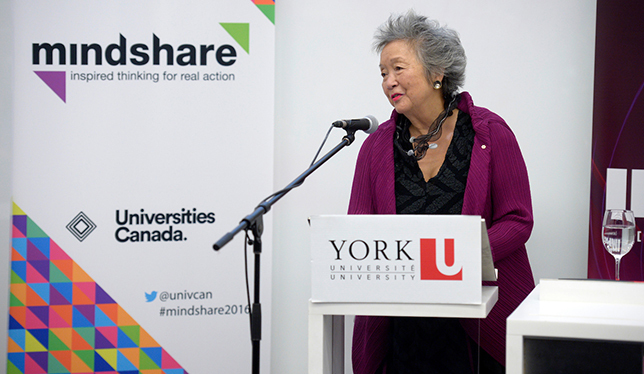 Former Governor General Adrienne Clarkson. Photo courtesy of York University. Drawing on her personal experience, Ms. Clarkson claimed that the trauma faced by refugees makes them more resilient and “able to look at complexity in a very different way.” Having had to rely on the kindness and openness of others, refugees “understand what it is to be kind” and become generous and community minded citizens. Refugees in our midst strengthen the fabric of Canadian society, she said. But, while celebrating the communal spirit and trust that characterizes Canadian society, Ms. Clarkson also acknowledged that many refugees in Canada face indignity and isolation. She offered two practical suggestions for how to improve the resettlement process for refugees in Canada: first, by making it easier for refugees to bring their families to Canada; and second, by calling on professional associations to recognize international credentials more readily. Skilled immigrants in Canada often abandon their past professions to take on lower-skilled work because of the difficulties of getting accreditation in Canada. The panel discussion following Ms. Clarkson’s remarks picked up on this theme: despite Canada’s record of welcoming approximately 12,000 refugees per year – and the federal government’s commitment to settling 25,000 Syrian refugees last winter – panelists agreed that there is much more to be done in the face of the global refugee crisis. Jennifer Hyndman, director of York’s Centre for Refugee Studies, reminded the audience that asylum seekers who reach Canada and other countries for resettlement are in the minority. More than three quarters of global refugees are “stuck” in long-term refugee camps in a state of deep insecurity. 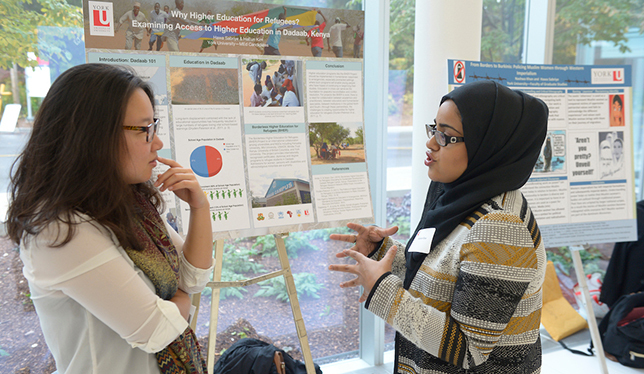 York’s Centre for Refugee Studies students discuss higher education options for refugees. Photo courtesy of York University. While Canada can be proud of its unique model of private refugee sponsorship – more than 200,000 refugees have been settled in Canada through private sponsors – the lack of formal research and knowledge about this model will make it difficult to replicate its success internationally, said Dr. Hyndman. Loly Rico, founder of the FCJ Refugee Centre, president of the Canadian Council for Refugees and herself a refugee from El Salvador more than two decades ago, made an impassioned call for more humane immigration policies that put an end to detention, particularly for young people. A revealing moment came at the closing of the panel session. When asked about the changes they have witnessed in decades of working with refugees, each of the panellists – Dr. Hyndman, Ms. Rico and Mary Jo Leddy of the refugee service Romero House – cited September 11, 2001 as a turning point in the political and public perception of refugees. Since then, they argued, refugees are often seen as potential security threats, rather than individuals in need of a safe haven. After an afternoon in which attendees examined forced migration issues at a local, national and global level, the event ended with an affirmation of the power of individual and community action. The World University Service of Canada has been bringing student refugees to Canada for more than 30 years through student-led private sponsorship. At a reception celebrating the work of these campus committees in the Toronto region, York student leaders recounted how this year they have been able to bring more students than ever to Canada through their efforts and the contributions of the university community. The Re-imagining Refuge symposium was part of Mindshare, a speaker series hosted by universities across Canada in 2016, and designed to promote fresh thinking and compelling conversations on policy issues critical to Canada’s future. Keynote speaker Ms. Clarkson’s remarks were livestreamed and can be viewed online at facebook.com/univcanada. Future Mindshare events will take place in Halifax and Quebec City on the topics of entrepreneurship and water security respectively. For more information, visit www.univcan.ca/mindshare.